WELCOME to the 20th issue of BYMRr-Zine - a newsletter published by Building Your Model Railroad, and devoted to providing breaking news and tips to model railroaders of all ages and all scales in a quick and easy-to-read format. Resources are always credited where appropriate. Even the smallest model railroad layout usually has some kind of train yard, even if it's only a track or two. It could be just one train that arrives for servicing, exchanging a few cars and for the crew to take a break before it goes on to its next destination. 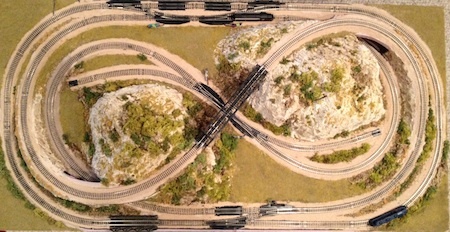 If you are trying to design a train yard for your layout, you may want to look at the new page written for the BYMRR site entitled simply Model Railroad Yard. This will give you some of the basics on concept and design. You should probably do a little Internet research as well in order to see how the prototypes do it. I mentioned this new track cleaning tool from Woodland Scenics in the last newsletter. I'm always looking for easier ways to do track cleaning, so I decided to buy the product and give it a try. It certainly does make track cleaning an easier chore. I could get under tunnels and clean rails through wooded areas with no problem. These places were always neglected before because they were so hard to get to without destroying the scenery. They furnish a track cleaning liquid with the kit which works pretty well. I always liked to use Goo-Gone for track cleaning so I ended up using that instead. I did notice that the erasure-type pads seemed to leave a black residue on the track. These pads are supposed to be used once a year or so for deep cleaning. Maybe I was pressing them into the rails with too much pressure. From now on though, I'm just going to use the regular cleaning pads. There were still some areas where I had to use an abrasive block to get rid of dried paint and glue, which is only to be expected. After cleaning I added a very small amount of transmission fluid to the rails to improve electrical pickup and provide smooth operation. I was pleased with the results and would definitely recommend this method of track cleaning as the best thing available so far. If you remember a few months ago, I mentioned that I was working on a small 2x4 foot, N-scale, "cookie-cutter" type layout using the cookie cutter method on a foam sheet instead of plywood. I thought I'd show a picture here of my progress so far. The roadbed, track and fine buff-colored ballast have been glued down, and some ground foam, lichen and small clump-foliage have been added. The tracks are wired with DC power, and the trains run well after cleaning and some minor troubleshooting. There are double railgaps separating the inner from the outer mainline to avoid polarity issues. I'll add an auto-reversing unit later so that trains will be able to run from one mainline to the other without difficulty. The turnouts aren't wired yet. I'm planning on adding some automated stops, starts and operating signals eventually. The track plan is basically a folded dog bone for the inner mainline and a simple oval for the outer mainline. When both trains are running, it provides a lot of opportunities for train "meets". I'll be adding a few structures and more trees and lots of other details before it's finished. This will make a great small layout for display anywhere in the home. It could be on a coffee table or just sitting on a display table. I let you know how this progresses in future editions of the newsletter. An engine service facility is another project I've been gradually working on for the BR&S layout. In the above picture, you can see that I've used an inexpensive Atlas turntable that has motor drive capability which has been installed and controlled by a toggle switch on the fascia nearby. 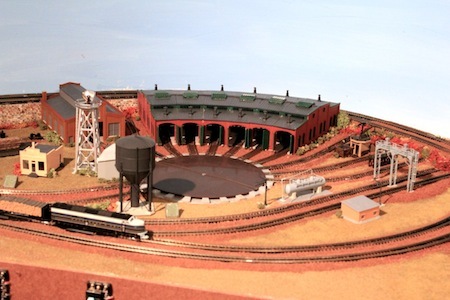 The presence of the turntable and the connecting roundhouse with indoor and outdoor storage tracks make the purpose of this scene unmistakable. Depending on whether you're doing steam, or diesel, or both, your engine service facility will need to have the appropriate equipment. If you're servicing steam engines, you will most likely want to have a water tower and some water columns, an ash pit, a coal tower, a sand-drying house with a bin, and perhaps an icehouse. If you're modeling diesel mostly, you will want to have a fueling station, a pump house, fuel tanks and tank cars, and a sand tower. Both types of engines will need a wash rack - though they may look a little different for each type. Both will usually have some method of turning engines around, perhaps a turntable or a wye. And both will need some type of storage and repair facility, like a roundhouse or maybe just a small engine house. You may find a machine shop nearby as well for servicing and repairing railcars. They both will usually have a yard office and maybe a control tower as well. A new product by True Scene Modeling, called Fusion Fiber is available now for creating mountains, cliffs and other aspects of landscaping. It has some advantages over Sculptamold, which is my old standby for creating textured terrain. 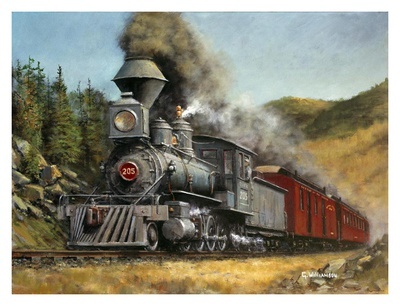 Fusion Fiber was reviewed recently by Steven Otte in Model Railroader, Sept, 2012, page 66, and appears to be well worth the $20 for a one pound bag. One nice thing about it is that it retains its adhesiveness after it is applied while it's still wet and regains the property just by adding water after it has dried. If you happen to mix too much of it at one time, just store it in a closed container and when you're ready to use it again, just add water. These properties give it an advantage over other terrain-forming materials. I'll definitely be giving this a try in the near future. Check out the website at True Scene Modeling (truescene.com). A better type of roadbed material, called Model Rail Bed, formerly known as EZ Track Bed, a moldable rubber mastic product, impregnated with granular cork, is available now that will make laying roadbed a lot easier than it has been. It's very flexible and can be put down easily on the layout surface (sub roadbed) without requiring glue or nails. The flexibility makes it much easier to lay on curves than any of the other available products. It also has an adhesive quality, or stickiness that allows the track that you lay on its surface to stick to it. It holds on to ballast as well. Other uses include sidewalks, streets, concrete structures, asphalt, coal-car loads, and even retaining walls. I wish I had had this available when I was laying track on the BR&S. It would have saved a huge amount of time and effort. The website where you can order the product is at Model Rail Bed (www.modelrailbed.com). A new HO decoder now available through Train Control Systems will allow your locomotive to run over dirty tracks or skip areas on turnouts without stopping, halting, hesitating or stalling. The new decoder keeps the motor running and drive wheels going for up to 5 seconds without any track power. For those of you who have had problems with this, like I have, these KA-series decoders will be nothing short of revolutionary as far as improving locomotive operation and performance are concerned. If you have a light-colored ballast, like buff or light gray, you may want to consider adding a wash of acrylic black paint mixed 50:50 with water. If you apply this liberally with a brush or dropper over the ballast, the shadows will be enhanced and your ballast will appear to have greater depth. 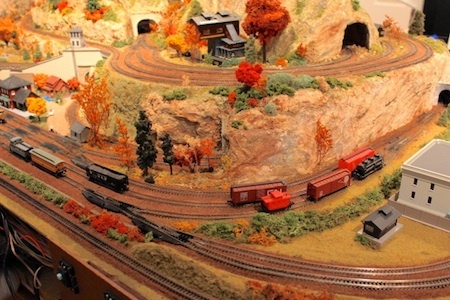 - The great Northwest comes alive on this HO layout by Don Cook.